The Dallas Holocaust Museum/Center for Education and Tolerance has played an important role in our community for the past 33 years, with a mission that has expanded to include teaching the history of the Holocaust, and advancing human rights to combat prejudice, hatred, and indifference. 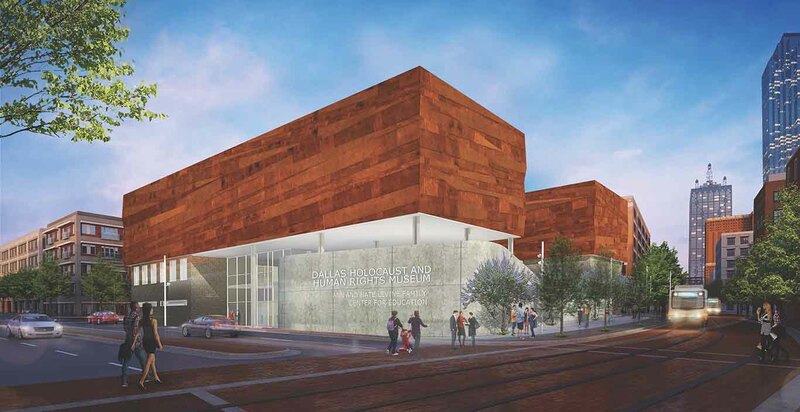 Because of the current rental location’s inability to meet the demand of the 86,000+ annual visitors, the Museum’s Board launched a campaign to build a state-of-the-art, 55,000 square foot permanent home in the historic West End, the Dallas Holocaust and Human Rights Museum. This new Museum, with its dramatically larger facilities and expanded educational and cultural programming, will galvanize the North Texas community to learn the lessons of the Holocaust to combat hatred and injustice. You will be able to look out the window of our program meeting space to see the new museum under construction. The Dallas Holocaust Museum currently has a special exhibition, Let Me Be Myself: The Life Story of Anne Frank, that explores her life in a modern way, addressing present day issues of identity, exclusion, and discrimination. Anne’s experiences connect deeply with today’s youth as they grow and learn that all actions and words matter. This exhibition will also feature the United States premiere of a Virtual Reality (VR) component from Force Field VR and Oculus Studios that allows the visitor to travel back in time to Anne Frank’s hiding place, the “Secret Annex.” In a one-of-a-kind experience, visitors will be drawn into the world in which Anne Frank lived -- in the shadows of genocide and war.